In this issue: three American writers chronicle their experiences. Two are happily expatriated to Britain and France, the third is traveling the world meditating on the nature of love, friendship and our relationship to the environment. 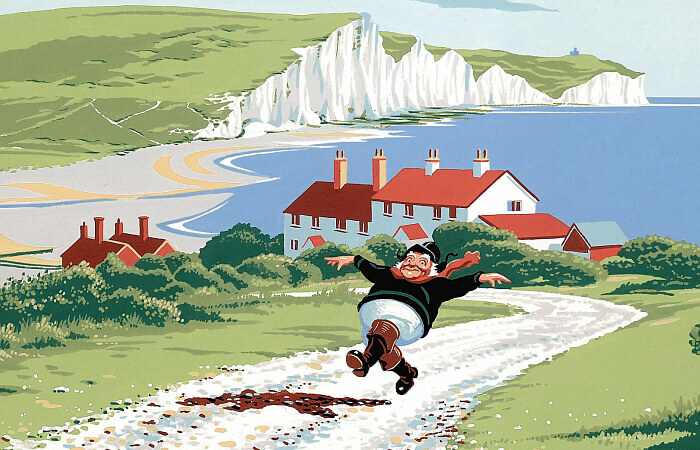 I suspect that the persona that comes across in all of Bill Bryson's marvelously entertaining travel books is not a construct but the way he really is—funny, acute, unsnobbish, sometimes grumpy, often avuncular. He is eager to bestow warm praise when it is warranted and equally ready to castigate stupidity and cupidity in individuals and nations. Bryson has lived in Britain on and off since he left Des Moines Iowa to go traveling in 1973. He has a (mostly) love-and (sometimes) -hate relationship with his adopted country. The style is cozily conversational, the topics wide-ranging. In one chapter on East Anglia he introduces us to an eccentric crab shack called Cookie's, the hard-to-fathom British love of steam trains, the inadequacies of sign writers' spelling, and an archaeological discovery made a few years ago in Happisburgh (pronounced Haze-burra) of the oldest human artifacts ever found north of the Alps. Plus there's a potted biography of an obscure German Jewish philanthropist whose mansion is now a hotel, statistics about how much litter washes up on these shores, and the story of the amateur who uncovered one of the greatest hordes of 6th century Anglo Saxon treasure at Sutton Hoo. The medley of facts and insights is never boring, always engaging, and sometimes laugh-out-loud hilarious. Take his description of a venerable old football (= soccer) ground, Goodison Park, in Liverpool where he attends a match with his family: "It was built in 1892 and is evidently the oldest surviving purpose-built football ground anywhere. This sounds charming but what it means in practice is that even places like Liberia and Burkina Faso have more modern, up-to-date stadiums." While ruminating on the important and benevolent role in banking and industry that Quakers played in the 18th century, probably because they were ostracized from politics and academia, he says â��It had never occurred to me to be unkind to a Quaker, but if that's what it takes to get the country back on its feet, I am prepared to consider it." He can also turn his wit against himself as he does after enjoying the Natural History Museum in Oxford: "I have always wondered what exactly are the differences between all the various kinds of British black birds—rooks, crows, ravens, and so on—and here it was all set out for me. I don't remember any of that now, of course (I'm sixty-three years old), but for a minute I knew and was enchanted." Like a stand-up comedian's routine, the jokes work because they touch on very recognizable truths, at least among those of a certain age. Of course it isn't wall-to-wall jokes and eccentric facts. A reader is left with a fairly clear state-of-the-nation report, much of it rather depressing. Many aspects of life in Britain today are far more bland and profit-mongering than when he toured Britain for his excellent Notes from a Small Island published in 1995. Bus shelters are uglier, souvenirs are sillier, youths drop more litter, and some London black cabs are being replaced by vans. The moral is clear: the survival of things that make the country special and the countryside lovely cannot be taken for granted. Those who deem them economically unviable and therefore neglect them risk slowly wrecking this magnificent little island. Even the subtitle brought on a little sigh of weariness. It is 26 years since Peter Mayle's A Year in Provence became a bestseller, and there have been many accounts published since of the discoveries and disappointments encountered in setting up a new home in a new place. Inevitably in these we learn the author's complete back story as we are introduced to a succession of neighbors, plumbers and cheesemongers. And if progeny are involved there will be plenty about the peaks and troughs of parenthood. This account of an American marrying a Frenchman in Paris and almost on a whim deciding to move to the village of Céreste just after giving birth to a baby son ticks all those boxes. However, Elizabeth Bard's sassy animated prose soon overcame much of my resistance. She acknowledges that she isn't Tolstoy but hopes she has "something real to say about what it mean[s] to build a life in another culture". She is good at particularizing cultural differences, from the hyper-discretion and respect for privacy practiced by the French, unlike Americans, right down to the way French people eat their salads, folded not cut. Having trained as an art historian, Elizabeth Bard now transfers to food the same close scrutiny of colors and textures, and her sensuous descriptions of the local market has the intended effect of making the reader's mouth water—although I was not tempted by all of her recipes like Champagne cocktail with shaved truffle and corn soufflé. Nor do all the flavors tried in the artisanal ice cream business they establish—tomato sorbet, geranium—set the heart racing. But it is a warm-hearted account of a love affair with France, and it is rewarding to accompany the author's transformation from New York urbanite to Provençal village entrepreneur. This title caught my eye because I happen to know about Grey Owl, an early conservationist in Canada who assumed a First Nations identify. On his death in 1938 the hoax was revealed, that he had been born Archibald Belaney in England. But it is not until one of the final chapters "Getting to Grey Owl's Cabin: Saskatchewan 2012" that the title's meaning becomes explicit. Disparate chapters based on Caswell's journeys over the past twenty years, in Japan, Morocco, Italy, Iceland and so on could serve as stand-alone essays. In my view more might have been made of the Grey Owl theme to unify the book. For example in an early chapter the author feels restless while teaching in Spain and "hungered for something natural, a bright star overhead, a tree to sit under, an empty land out in front of me," which is pure Grey Owl. And the first chapter includes a vivid description of a white water canoeing trip in Hokkaido, Japan, which is clearly influenced by Grey Owl's writing about the joys of paddling. Set piece scenes are memorable, like the author's unhappy experience as a young man at a sauna in China where he keeps being offered the "special massage" and is deterred from accepting because he is worried about the price. The prose can be self-consciously elevated, even verging on the mannered (Caswell teaches creative writing), though is usually brought back to the colloquial, with a parenthetical "What was I thinking?" or a confessional anecdote. "The journey is not over until you have told its story" he says, and he is a good storyteller. He takes the most clichéd of tourist situations and makes them fresh, interesting, sometimes comic—a gondola ride in Venice, bullfight in Spain, encounter with a carpet salesman in Morocco. But not all of his riffs and digressions are convincing. After succumbing to the irresistible wiles of the Moroccan carpet salesman, he devotes some pages to a theory he's read about the symbolic decoding of kilims, which did nothing for me. While doing a challenging hike in the extreme northwest of Iceland, he opines that walking is difficult "because it re-creates the original pain of birth and the inevitable separation from the mother." Hmmm. In A Walk in the Woods, Bill Bryson famously described hiking the Appalachian Trail with his childhood friend Stephen Katz. Like Katz, Caswell's school friend Scott, with whom he shares many of his journeys, is slightly overweight, but not at all a Katzian buffoon. Several affecting passages dwell on the comfort to be derived from the company of a trusted travel companion, that keeps at bay the loneliness that "sinks the heart from a high place of exaltation to the darkness of fear and loss." This is a thoughtful and original book worth reading. Susan Griffith is a Canadian travel writer and editor based in Cambridge England, who writes books and articles for adventurous working travelers. Starting with the classic Work Your Way Around the World and Teaching English Abroad, she has also turned her attention to gap years and has written definitive guides for the young and the not-so-young: Your Gap Year and Gap Years for Grown-ups. She also contributes to the travel pages of the Independent, a British daily newspaper.